St. Martin's Press, 9780312543495, 320pp. With practical ideas and measurable outcomes that every business can use, Anderson shows that profit and sustainability are not mutually exclusive; businesses can improve their bottom lines and do right by the earth. RAY ANDERSON was named one of Time magazine's Heroes of the Environment and one of MSNBC.com's Top 15 Green Business Leaders in 2007. He and Interface have been featured in three documentary films, including "The Corporation" and "So Right, So Smart." He co-chaired the President's Council on Sustainable Development and the Presidential Climate Action Project. He and Interface have been featured in The New York Times, Fortune, Fast Company, and many other publications. 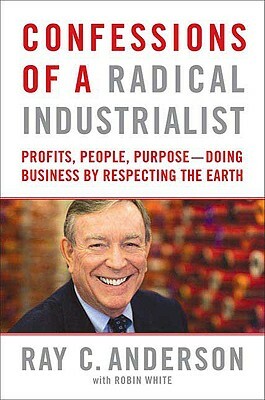 “Anyone who thinks that business leadership on environmental sustainability is an oxymoron must read Confessions of a Radical Industrialist. In a humble, inspiring and informative manner, Ray Anderson describes his own journey to not just tweak the edges of his business towards green goals but to fundamentally re-think and re-design every aspect of its operations to respect environmental limits.